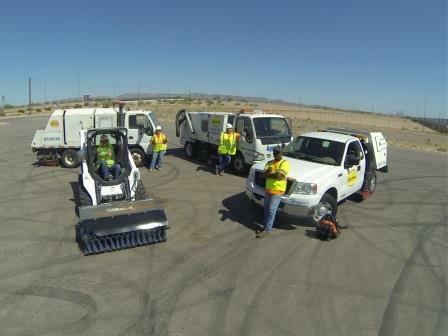 Locally owned and operated Agua Trucks, LLC has offered street sweeping, parking lot sweeping, construction sweeping and water truck service for municipalities, HOA’s, property managers, and contractors in the Phoenix area since 2006. Our company is founded on a very simple premise–sooner or later, every Phoenix-area contractor needs water truck service, sweeper service, water trailer rental, and BMP maintenance and installation. The key to our exceptional sweeping service is a fleet of exceptionally well maintained mechanical broom sweepers, vacuum sweepers, and regenerative air sweepers manned by operators with over 80 hours of professional training in sweeping best practices. Agua Trcuks is fully licensed and insured, our team stands ready to tackle your property’s dust, dirt, and debris night and day, 365 days a year. From common parking lot dirt, debris and litter to sand, gravel, paving millings, and construction site track-out, we can make your property shine. Whether your property, municipality, or construction site requires an emergency sweep, one-time cleanup, or regularly scheduled power sweeping service, we have the equipment and skilled personnel to meet your needs and budget. 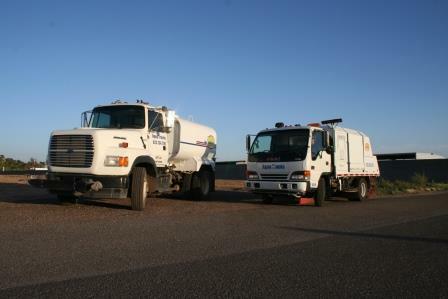 Agua Trucks services the greater Phoenix Metropolitan area, most of Maricopa County, the Town of Maricopa and Anthem.